Property on 3 levels very well furnished and equiped. Master with double and large roof terrace. 2 twin bedrooms can be pushed together to make 2 x 6Ft doubles. 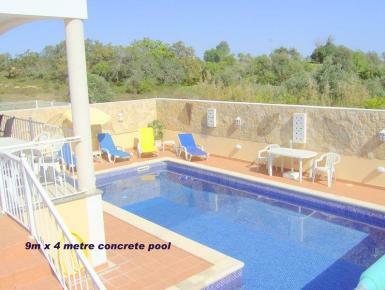 Great location in sleepy village but only 5 min drive To Amercao de Pera and 15 min to Albufeira centre. Algarve shopping and zoomarina 5 min drive as is many local beaches.and famous golf courses Salgados and Amondeira., Village is 2 min walk with cafe/bars supermarkets,internet shop,pharmacy beauty parlour and small daily market. Bus servive to surrounding area.Taxi to nearest lively beaach resort 7 euros and about 15 to Albufeira..